random thoughts...do or "di": Are You Creative? Do you consider yourself creative? I am one of those people who love to make things but do not consider myself creative. Now I am not looking for you to say, "oh yes, you are creative", I am simply stating a fact. I can take a pattern or someone else's suggestion and build on it but I cannot think of things myself, as a general rule. That brings me to the bee I put together called Stitch Tease. The eight of us in this bee are all starting our own quilts with our own "ideas" and then it will be a round robin bee. My idea was to incorporate words along with some of my favorite blocks and paper piecing. 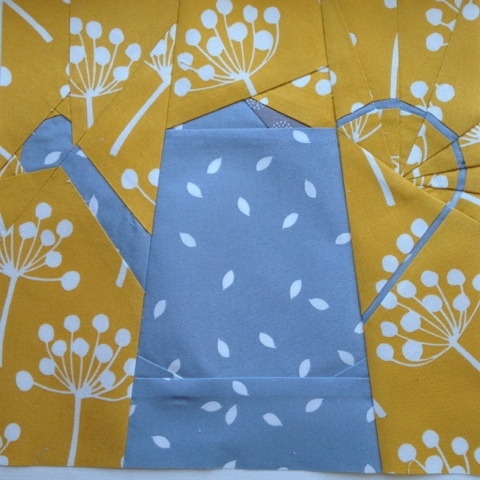 When I saw Amy's paper pieced block for a watering can I new I would have to incorporate this into my quilt some way and of course the word would be GARDEN. This is as far as I got today. The block was well designed and the instructions were super easy to follow, but now what do I do with an almost 10" block? How do I incorporate the word GARDEN into this block and make it approximately 25" square? I've been sketching all afternoon and still don't know how I will complete this beginning block to my quilt. But I do love the beginning and hopefully I will complete it this weekend. edited to say that Amy pointed out a small error and I have corrected it. Thank you, Amy. Now the block looks like it should! Will inspiration strike? More than likely I need to hop over to Pinterest and get inspired. In less than exciting news, I have gotten a haircut and I can't tell you how much better I feel. I just was not loving the longer hair and the hassle that goes along with it. This is more me! Great haircut! 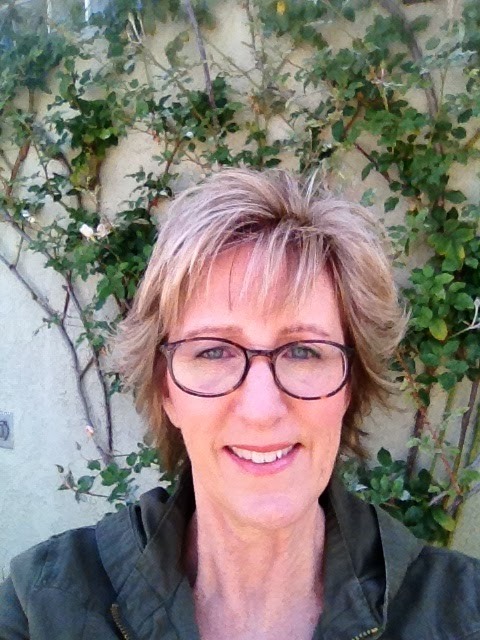 I have always worn my hair short/short!! Your watering can block is amazing! The girl who runs The Patchery Menagerie did a whole series on making pieced letters. That may help with your garden word?? Yay for short hair! I'm actually growing mine out right now and it's been a bear. Blech. I may be cutting it short again soon if my patience wears out. Your block looks fantastic! I've never tried paper piecing, but I have to do it for a bee block this month so hopefully I'lll get a little practice before my turn to make your block (although, you stole the word I was going to use for you!!!) And I get the creative thing. I don't necessary consider myself creative but I can definitely make something someone else has made!! I feel ya! Like your haircut. I'm like you...not very creative or imaginative, but very good at following instructions. I might embroider the word on the block, either by hand or machine. I'm exactly the same way, I can build on something or adapt it but I'm pretty useless at starting from scratch!! I love that there's so many great patterns and inspiration on blogs otherwise I'd be permanently stumped! You're looking great and scaring the pants off me! Pieced watering cans???? Way outside my comfort zone!!! I love the haircut! I am not a particularly creative person either. Like you, I am good at building on other people's ideas but struggle a bit with being "blindly creative". I am sure you will come up with something brilliant though! I have a really hard time incorporating pieced letters into blocks. I'm loving the concept, though, and your PP watering can is fab! Your hair is lookin' great! Love the new hairdo, and love the watering can! I am with you on the creativity - I think I can lend myself to adapting other peoples ideas very nicely, probably in a ratio of 9:1 of my own ideas! Can't wait to see how your block turns out, as I will be copying, I mean adapting, it! Your haircut looks great! Love your blocks. look at you cutie, and yea for shorties - although I`m not at all short...but my hair is. Love the watering can and I am having `mares with my quilt but it will all be okay! Like the new hair do -I keep mine very short too because it's so much easier. I looovee the watering can, but yes, you stole the word I was thinking of using! I shou;d've guessed you would!